The page was getting too large so I started a new one for 2017. Sorry for the lack of updates recently, I have been very busy moving into a new apartment in Zhuhai. I am now on my way to Canada, I had an overnight layover in Beijing last night. Here is a quick speed test with ExpressVPN and VPN.ac, this will be the last speed test from China for 2016. This is done from the Home Inn near Beijing airport. I wouldn't normally do a speed test using a hotel WIFI but I had to do one more test before I left. I am using OpenVPN TCP for all servers because UDP seems to be blocked here. Nothing is working especially good here but these 2 seem to be the best of the worst. Last night when I was using VPN.ac South Korea Seoul server I found out that South Korea, like China, also censors the internet. When I tried to access a certain website I was redirected to this page instead. For the past few weeks at home I have been using ExpressVPN Hong Kong 3 exclusively (through my Linksys WRT1900ACv2 router) because it is simply the most reliable solution and I was too busy to try different servers. On mobile data when I was out, I was mostly using VPN.ac Tokyo 2 (this server works very well with my China Unicom mobile data). If you want to try ExpressVPN, remember to go the Best VPN for China page to take advantage of the special pop-up offer for 3 months free. I'm getting very fast speeds from my top 3 recommended VPN servers for China this morning. If you want to try these VPNs, they are all available with a money back guarantee and with some great special discounts! StrongVPN HKG301/HKG302 seems to be working good with OpenVPN TCP again. Now UDP is not working very well but TCP is working very good (same situations as before). VPN.ac Hong Kong 1 also started working good with TCP again last night but this morning the speed is not so fast. Of course ExpressVPN Hong Kong 3 OpenVPN UDP is working good as always. The VPN.ac Secure.Proxy Hong Kong location suddenly became very slow a few hours ago after working great over the last few days. Now I switched to Tokyo 3 with the proxy extension. 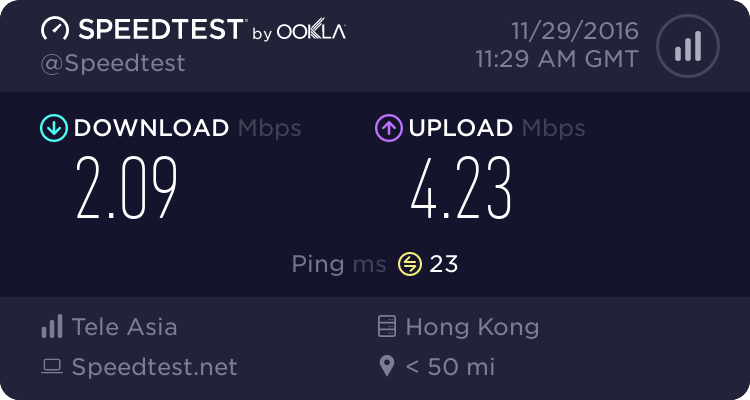 It's not quite is fast as the HK location was but still not bad. As for VPN connections, the only good servers I am happy with right now are these ones. China Telecom continues to throttle VPN connections today. I'm not getting great speeds with anything except the VPN.ac Secure Proxy Chrome extension with the Hong Kong 1 server (this server is just called "Hong Kong" in the proxy extension but is called "Hong Kong 1" in the VPN software). When I connect by VPN to that same server I can only get 1M - 2M download speed. Same with all the other VPN.ac Asian servers, nothing higher than 2M right now. If you are using VPN.ac VPN and need higher speed but can't use the browser proxy, I suggest Los Angeles 2. The speed is not bad and latency is good for USA. If latency is more important then use Hong Kong 1, Seoul, Tokyo 2 (China Telecom) or Hong Kong 2, Seoul, Tokyo 1, or Tokyo 2 (China Unicom). ExpressVPN Hong Kong 3 is still working very good. It's extremely stable and reliable on my Linksys WRT1900ACv2. Speed is not that great but the latency and reliability is more important to me most of the time. This is the main connection I am using for my every day internet usage. If I need higher speed then I will switch to my main WIFI and use the VPN.ac browser proxy extension. 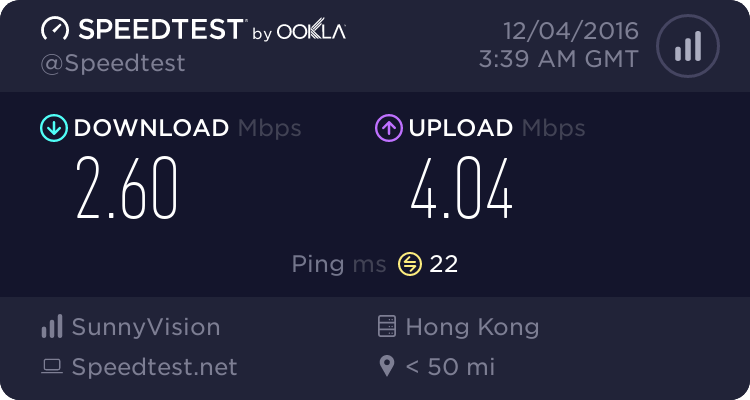 StrongVPN Hong Kong HKG302 is still working relatively well but I did change some settings and reconnect a few times before I got a good connection. I am now using UDP with the scramble option enabled from the customer area of the StrongVPN website. Latency is very good, speed is better than VPN.ac Asian servers but still not great for this time of day. I just got back home to Zhuhai and now using China Telecom again. ExpressVPN Hong Kong 3 on my Linksys WRT1900ACv2 is still working very good. Download speed is not great but it's the low latency and high reliability of that server that is so special and the reason I keep it on my VPN router. I'm usually happy with anything above 5M if the latency is under 20ms. Next I switched to my main router to do some more testing. First test was VPN.ac Hong Kong 1 but I was not able to get the usual good speed from that server. The speed is under 2M. However, if I connect using the VPN.ac Secure Proxy Chrome extension to this same server (Hong Kong 1) I get very fast speed. I did the test 3 times just to make sure it wasn't a mistake. I was using beta.speedtest.net for the tests using the VPN.ac Secure Proxy Chrome extention because the main site speedtest.net uses Adobe Flash which will bypass the proxy during the speed test. The site beta.speedtest.net uses html5 so a proxy can be tested as well as a VPN. I did, however, check the resourse monitor to see what IP address I was connecting to for the speed test because I thought maybe the proxy was being bypassed even though it was an html5 test (this has happened before). I confirmed the speed test connection really was going to VPN.ac proxy server. Next I am testing the speed of StrongVPN HKG302. As with VPN.ac Hong Kong 1, the speed with TCP is also slow. However, it is fast with UDP using StrongVPN HKG302. It seems like China Telecom has started to throttle the speed of OpenVPN TCP connections. The servers that used to work good with OpenVPN TCP (VPN.ac Hong Kong 1 and StrongVPN HKG301/HKG302) are now very slow. I was always using UDP with ExpressVPN so nothing changed with ExpressVPN Hong Kong 3. Luckily, StrongVPN HKG302 is now working good with OpenVPN UDP now. Last test is VPN.ac Hong Kong 2, the server that was working so good for me over the last few days using China Unicom. Unfortunately it does not work as good with China Telecom. If you are using VPN.ac with China Telecom I highly recommend using Hong Kong 1 with the Secure Proxy extension. I just finished a very extensive VPN speed test using China Unicom, you can see all the results here. Overall, China Unicom is much better for VPN connections. More good servers available, faster speeds during the day, and much faster speeds at night! I highly recommend switching for China Unicom if it is available in your area and most of your internet traffic is VPN traffic or other international traffic. China Unicom has much more international bandwidth available than China Telecom. Remember to take advantage of the Thanksgiving / Black Friday / Cyber Monday sales on the sidebar if you are looking to try a new VPN. I just tried VyprVPN with China Unicom and it works much better than I expected. I do not recommend using VyprVPN with China Telecom because it's very slow and there are no direct connections from their servers in Asia to China Telecom. If you have China Telecom then VyprVPN is just barely fast enough to watch Netflix in HD but not good for much else. However, with China Unicom it's actually performs very well. First, I checked the ping times using the software and saw that Singapore had a decent ping time. I connected using Chameleon and got 12M which is much faster than I can get with any VyprVPN server using China Telecom. Next, I tried changing the protocol to OpenVPN. With China Telecom OpenVPN doesn't usually work with VyprVPN, you must use Chameleon. I had a feeling that it would work with China Unicom and I was right! I was surprised to see 40M because the broadband connection here is only 20M. The speed sometimes goes up to 40M - 50M at the beginning of the test but it goes down to 20M by the end of the test. After checking the speed without the VPN and getting 22M, I tried the VyprVPN Singapore server again. That result makes more sense. I don't know what happened during the 41.64M test, I guess China Unicom will sometimes allow you to go over the speed of your package for a short time. Finally, here is a test using the VyprVPN San Francisco server with OpenVPN. If you are using China Unicom then VyprVPN is highly recommended. Previously I thought all the people who said VyprVPN worked good in China were stupid. Maybe they are not stupid after all, they are probably using China Unicom. Not only can you get great speed with China Unicom, VyprVPN is also one of the few VPNs that works for Netflix. ExpressVPN and StrongVPN also work for Netflix but the speed with China Unicom is not as fast as VyprVPN with the USA servers. I have never seen Netflix load so fast as with VyprVPN San Francisco just now. I have quite a few different promotions for VyprVPN, check this page for the details. I was just thinking about the speed and latency from the tests yesterday with China Unicom. Some servers work good with both China Telecom and China Unicom but some servers only work good with China Unicom or only work good with China Telecom. With StrongVPN the HKG301 server has a direct low latency connection to China Telecom and is one of my top recommended servers for China Telecom. However this server has a very high ping time to China Unicom. 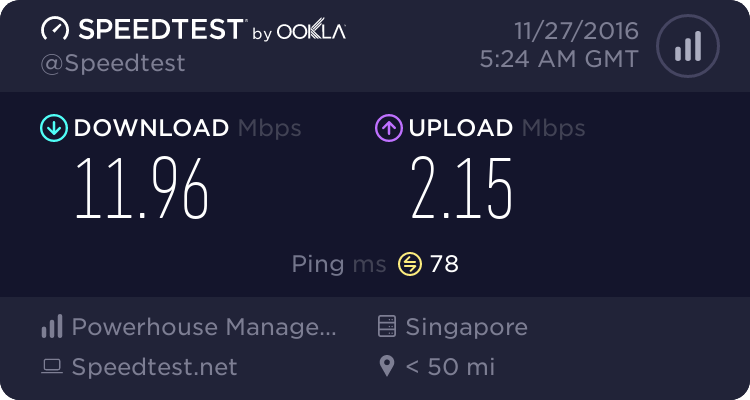 As seen in my speed tests yesterday the Singapore servers have a direct low latency connection to China Unicom. I'm curious to see how these Singapore servers perform with China Telecom as I don't recall trying them before. If you have a China Telecom connection please help me do this test. You don't need a StrongVPN subscription, anyone can do this. Simply turn off any VPN or proxy and go to the StrongVPN server speed test page. Choose Singapore and shared IP as shown below. Do the speed test for one of these servers. After the test is finished, click the button "share results" (to the right of the "test again" button) and send me the link by email or in the comments section below. It looks like VPN.ac is having a Black Friday / Cyber Monday sale as well. Get a 45% recurring discount (normally you can only get a 25% discount with my coupon code). VPN.ac Hong Kong 2 is the VPN I am currently using with China Unicom in Guangxi province and it's been working extremely well all day long. Right now I am actually get higher than 20M even though the connection here is only supposed to be 20M. StrongVPN is having a thanksgiving special. Save 25% off the annual plan. I am currently at my girlfriend's family's home in Yulin, Guangxi province. They have China Unicom 20M internet here so I will be doing some VPN testing with China Unicom ISP over the next few days. The first thing I noticed when I arrived last night is that VPN connections are much better compared to China Telecom at home in Zhuhai, Guangdong. I have heard that China Unicom is much better for international traffic and VPN traffic but unfortunately China Telecom has a monopoly in the complex where I live in Zhuhai so I have never been able to try it. If you have China Unicom available I highly suggest that you try it. 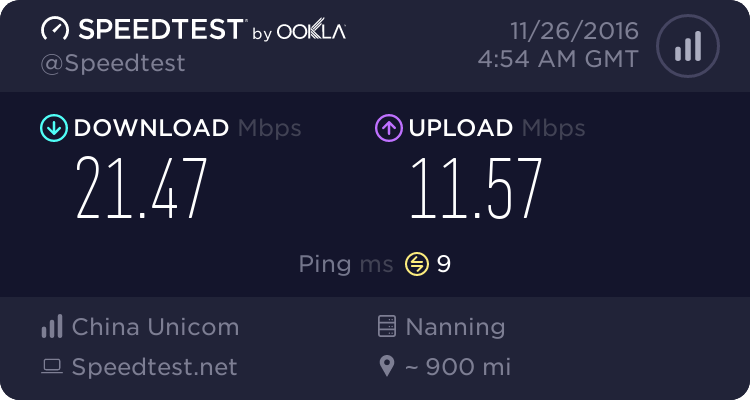 Even a 20M connection from China Unicom is better than a 100M connection from China Telecom when it comes to VPN connections. Here are a few speed tests at 1:00pm, I will do more tonight. First, my speed without VPN. ExpressVPN Black Friday / Cyber Monday sale starts at midnight tonight. Here are some speed test results for servers in Hong Kong, Taiwan, and Los Angeles between 7pm and 8pm. I used beta.speedtest.net because I was also testing 12VPN web proxy (flash based tests such as speedtest.net will bypass the proxy). If you look at these results then I think you will understand why I prefer good Asian servers over USA servers, especially at night! For those of you who missed the ExpressVPN Singles Day Sale you have another chance coming soon. The same offer will be available for Black Friday and Cyber Monday. Sign up for 12-months between Nov 25 - Nov 29 and get an extra 3 months free. Check this page for the details. I am still using ExpressVPN Hong Kong 3 server with the ExpressVPN router app on my Linksys WRT1900AC V2. It's still working great. I just finished a new YouTube video comparing the YouTube streaming speeds of StrongVPN HKG302, ExpressVPN Hong Kong 3, and VPN.ac Hong Kong 1. Watch the video below. To celebrate singles day and showcase the powerful combination of ExpressVPN Hong Kong 3 with the ExpressVPN router app on the Linksys WRT1900ACv2 I have flashed the ExpressVPN router app back on to my router. Low latency and blazing fast speed even at 7:30pm! Try ExpressVPN risk-free for 30 days and get an extra 3 months free if you sign up here for a 12-month subscription before Nov 12, 2016 12:00pm. I created a countdown page to the big ExpressVPN sale. Here is the URL, visit this page tomorrow! VPN.ac Hong Kong 1 is back online and I'm getting very good speed right now with OpenVPN TCP. I just received notification that ExpressVPN is going to have a special promotion for singles day. You will get 3 extra months free if you buy a 12 month subscription (15 months for the price of 12 months). Use this special promotion link between the above times you will get the 3 bonus months. Clicking the link now will not do anything, it will only be active between the above times! You can also get the Linksys WRT1900AC v2 (WRT1900ACS) for 999yuan on singles day. All 3 of the below Tmall sellers are putting it on special November 11. Remember that the Linksys WRT1900ACS is one of the few routers that works with the new ExpressVPN router App and the only way to use the Hong Kong 3 server on a router! It's been a while since I used a USA server. VPN.ac Los Angeles 2 OpenVPN UDP is performing quite well right now. I have been busy recently and not much time to test different VPNs. I'm still using StrongVPN Hong Kong HKG301 OpenVPN TCP (with scramble option) on my router and it's still working great. On mobile data when I'm not at home I have mostly been using ExpressVPN Hong Kong 3 which is working great too. I haven't used VPN.ac too much recently but it was brought to my attention that Hong Kong 1 data center was moved to the Hong Kong 2 location. I contacted support and they told me it's only a temporary measure because of a hardware failure. If anyone is using StrongVPN remember to follow my tips from the October 10 entry. Changing the protocol from UDP to TCP and enabling the scramble option from the website is especially important. The software is buggy so it often doesn't actually get changed if you change the settings in the software. Important Note - If you are using the Windows app you must remember to log-out (not only exit the app but log out) and log back in after changing the server settings from the website. Changing the server and protocol works better in the Android app but it still has problems sometimes. You can always check in the client area of the StrongVPN website to confirm what you settings are. Your settings should look like this for HKG301 or HKG302. These 2 servers are by far the best ones and I wouldn't bother changing servers after getting a slot on one of these unless you have a specific need for another location such as watching Netflix for example. Make sure that TCP is selected and scramble is in enabled. If not then choose TCP and enable the scramble option and then save changes. You can also try with UDP but it probably won't work as well as TCP for the Hong Kong server. If you do choose UDP then it probably won't work with scramble so you will need to disable scramble if using UDP. Some of the USA servers work better with UDP and no scramble but the Hong Kong OpenVPN servers work much better with TCP and scramble. The servers from yesterday's network analysis. Congratulations to John for correctly guessing servers 2, 4, and 6. This test just confirms what I already know. ExpressVPN Hong Kong 3 is the overall best, most reliable, low latency connection to China Telecom. StrongVPN HKG302 is quite good too and I prefer it because of the higher download speed even if the latency and reliability is not quite as good as ExpressVPN Hong Kong 3. VPN.ac Tokyo 2 actually had the lowest packet loss but the latency was high for the first half hour, you can see on the graph how it changed at 9:05pm. This Tokyo 2 server actually works much better with China Mobile and China Unicom although it sometimes is pretty good with China Telecom too. If anyone knows of other good low latency Asian VPN servers that are worthy of comparison to these ones please send me the server address or IP address and I will include it in the next analysis. Tonight I did some network analysis of 6 VPN servers using Ping Plotter. The 6 servers were monitored over a period of 1 hour from 8:30pm to 9:30pm (time of severe network congestion using China Telecom). Below you can see the results of the average latency, lowest latency, and packet loss. The network analysis was done between my computer and the VPN servers. My computer was not connected to a VPN, only monitoring the quality of the network connection between my computer and and the VPN servers. This is a very good indication of how VPN servers perform when you connect to them. The 6 servers tested were StrongVPN HKG302, VPN.ac Hong Kong 1, VPN.ac Hong Kong 2, VPN.ac Tokyo 2, ExpessVPN Taiwan 1, and ExpressVPN Hong Kong 3. Can anyone guess which server is which? Leave a comment below if you want to have a guess. I will update the page tomorrow and reveal which server is which one. Please check out my new Facebook fan page if you are interested in getting the latest VPN tips and China tips. Some more tips from website visitor John. Here is a good website if you are looking for sports streaming. 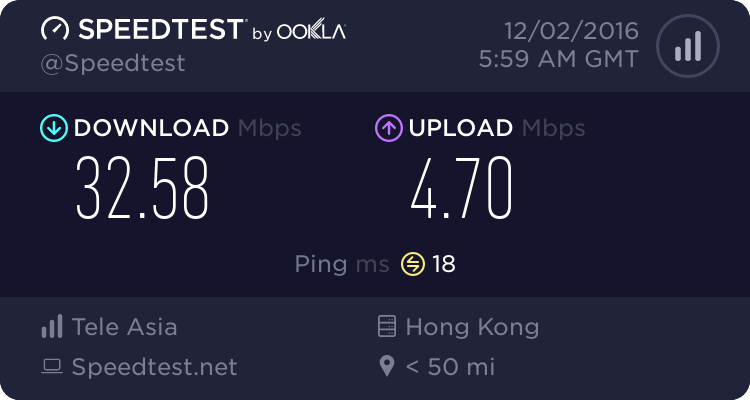 Unfortunately I need to go to to work now so I don't have time to speed test any VPNs, just a quick test from my VPN router running StrongVPN HKG302. Well I'm certainly not getting the same results with ExpressVPN Los Angeles that I was this morning. Here is my test result using that same server at 9:15pm. This is typical of most USA servers when connecting from China Telecom at this time of night. The only good night-time routes out of China for me are through those few good Hong Kong servers from VPN.ac, ExpressVPN, and StrongVPN. I was just chatting with webstie visitor John and he told me some interesting things. There is a website called www.streamlive.to where you can watch live streaming TV for free. I'm currently watching CNN. Go check it out www.streamlive.to and watch some live TV if you have a fast enough VPN. If you are a VPN.ac, ExpressVPN, or StrongVPN subscriber and you read this blog then I'm sure you won't have any problem! The ExpressVPN Los Angeles location has 2 different servers. 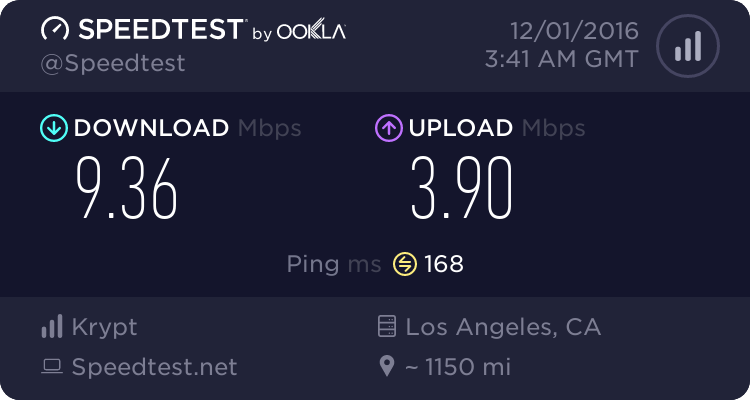 The two speed tests I did today ExpressVPN Los Angeles (the fast one in the morning and the slow one at night) were both using the Contina server. There is another server that gets geo-located on the east coast but I did confirm that the other server is actually in Los Angeles. I confirmed this by doing this test and I saw that Los Angeles had the lowest ping. That is the best way to find out the real location of any VPN server. With ExpressVPN the geo location is often wrong but the real location is always what they say it is. I am doing some research today for a new page I going to make soon called "Best VPN for Torrenting". In addition to researching privacy and logging policies of course I am testing speed too. I tried ExpressVPN Los Angeles server with a well seeded 1.4 GB torrent and found that I got very good speed. The average was 5.2 MB/s (41.6 Mb/s). I did a speed test and found the speed was around the same. As all my regular readers know I always prefer low latency Hong Kong servers but if you like USA servers then ExpressVPN Los Angeles might be a good choice. I need to try it again tonight during busy bandwidth hours to see if it's still good at night (normally China Telecom routes to USA are severely congested between 6pm to midnight). If you are torrenting then latency is not important at all so you don't need low latency Asian servers when torrenting from China. Actually the latency of 161ms is pretty good for a USA server. As far as USA servers go this is the best performing one I have seen in a while. VPN performance is always better in the morning no matter what servers you are using. I have been running StrongVPN Hong Kong HKG302 (OpenVPN TCP with scramble option enabled) on my Linksys WRT1900AC v2 for a while now and it seems like the performance keeps getting better and better. I am currently getting 66.18M with 18ms latency which is amazing speed for a router. Of course I can't get this speed all the time but once in a while it happens. The Linksys WRT1900AC has a dual core 1.6 GHz CPU (only advertised as 1.3 GHz but actually has a 1.6 GHz CPU). If you can afford this router it's a highly recommended VPN router. This is also one of the few routers that is supported by ExpressVPN's router app (however I'm currently running DD-WRT on it with StrongVPN HKG302). Here is the link on Taobao (T-Mall). The price is currently listed as 1,499 yuan but it says that after you place your order you will get a 200 yuan discount so the actual price is 1,299 yuan. They are advertising it as a WRT1900ACS but it's actually a WRT1900AC v2 (the hardware of these 2 routers is actually the same as shown here). They say it can come with OpenWRT but I would ask them to flash DD-WRT instead if you are using StrongVPN because StrongVPN doesn't support OpenWRT. Or, just flash dd-wrt yourself (or flash ExpressVPN's router App). I'm currently using dd-wrt. Note - Tips for China has no affiliation with the Taobao (Tmall) seller above. I bought my router in Canada, not from Taobao. I take no responsibility for the accuracy of the listing or the quality of the router. However it is a Tmall listing which means it's highly unlikely to be fake. Buy it at your own risk of course. I tried a few of my other favorite servers to see how the performance compared to StrongVPN on my router. These were connected to using the Windows app via my main (non-VPN) router. I forgot to mention that last week I discovered Astrill has deleted my affiliate account without telling me. All the previous links to Astrill will now go to this page instead. I just got back from travelling in Jiangsu province (near Shanghai). The internet connection I was using was mostly from China Mobile and my VPN experience was totally different. I found that VPNs all worked much better using China Mobile even using my hotel WIFI connection. The best performing server was VPN.ac Tokyo 2 but ExpressVPN Hong Kong 3 and StrongVPN Hong Kong OpenVPN were working good too. The Hong Kong servers of VPN.ac and ExpressVPN still had better latency but the download speed was much higher with VPN.ac Tokyo 2. I'm back in Zhuhai now and the only server I can find right now (between 10:00pm to 10:30pm) which can play YouTube in 1080P is StrongVPN Hong Kong OpenVPN. I am getting 18.4M streaming speed with StrongVPN Hong Kong OpenVPN HKG302 at 10:13pm. I have been searching for another server that can handle YouTube 1080P right now but I can't find one. 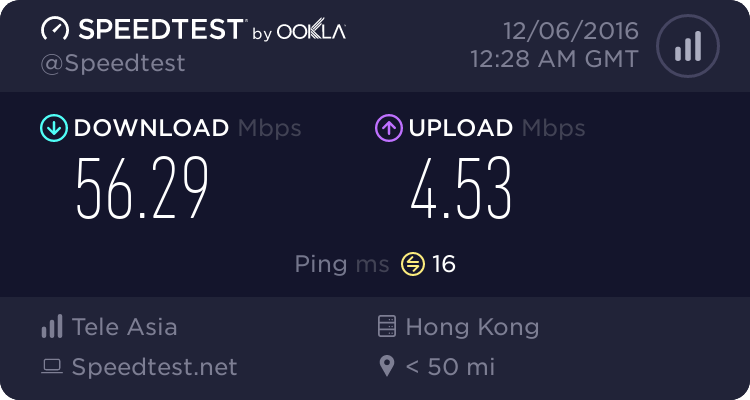 Even ExpressVPN Hong Kong 3, VPN.ac Hong Kong 1, and VPN.ac Tokyo 2 are only giving me 1.5 - 2M streaming speed right now (ok for 720P but you need around 3M for 1080P). I tried more Asian servers and USA servers using ExpressVPN, VPN.ac, and VyprVPN but I could not find anything else that could stream 1080P without buffering. After half hour I gave up. When I discovered that the StrongVPN Hong Kong server was working so well I suggested to StrongVPN to add another server in the same data center. That server was getting too popular and sometimes it was hard to get a spot on it (with StrongVPN each server has a limited number of slots and when you change servers you give up your slot on the existing server). They actually took my advice and added another server! There are now 2 servers in that same data center Hong Kong. You can now choose Hong Kong HKG301 and Hong Kong HKG302 (if both are available then choose the one with more slots open). This is the first time that a VPN company has actually implemented one of my suggestions (I have given many such suggestions to several VPN companies). Although StrongVPN still needs to improve their software and user friendliness before it can be a top rated VPN I am really impressed that they actually followed a suggestion from a user. If you using StrongVPN in China remember to read the tips on my October 10 entry to get the best performance. If you don't mind using software that is not very user friendly but just want a high performance server with a fast, low latency connection to China Telecom then I highly recommend you try StrongVPN Hong Kong HKG301 or HKG302. They have a 5 day money back guarantee so you can try it out risk free and see if it works as good for you as it does for me. When I compare YouTube streaming speed I am getting much faster streaming speed with StrongVPN Hong Kong compared to ExpressVPN Hong Kong 3. Although ExpressVPN Hong Kong 3 is a better server in general I think StrongVPN Hong Kong is superior for YouTube. ExpessVPN Hong Kong 3 is back! I am currently getting 9.8M with 16ms latency. Hong Kong 3 is always the best server during peak bandwidth hours at night. I will compare with my other 2 favorite servers. ExpressVPN is now once again the best VPN for China. Thanks to website visitor Ryan for telling me that Hong Kong 3 was back. I was planning to re-write this page tonight so you saved me a great deal of time. Around this time of night you can get very fast VPN connections. I'm now getting close to 50M through my VPN router with StrongVPN Hong Kong OpenVPN TCP. I thought this router was only capable to get 40M but I guess I was wrong! I also tried streaming YouTube in 4k just for fun even though the resolution of my monitor is only 1080P. The speed was fast enough to play smoothly with 4k resolution! It's just after midnight and I have successfully flashed StrongVPN Hong Kong OpenVPN TCP on to my Linksys WRT1900AC router with dd-wrt firmware. Speed is pretty good. I am currently getting 22M from YouTube and 25M from speedtest.net. I was surprised to see the comment from Paulo in Shandong who is not getting very good speeds from StrongVPN Hong Kong or from ExpressVPN servers. I should mention that you will see different results depending on what part of China you are in and who your ISP is. If you are in Southern China using China Telecom Fibre Optic 100M then your results will probably be similar to mine. If you are in Northern China I suspect you will get better results from servers in Japan and South Korea. Paulo, if you are reading this please contact me by email and I will help suggest some more servers to try and tests that you can run. Finding these kind of high performance servers is not easy but it can be done. I am using StrongVPN Hong Kong OpenVPN TCP to watch YouTube right now and it's blazing fast. I'm getting 26M streaming speed which is amazing for this time of night (7:20pm)! StrongVPN has a maximum number of slots per server. If a server becomes full you need to wait until a slot opens. Once you get on the Hong Kong OpenVPN server do not change servers. You don't need to stay connected to the VPN, your spot on the server is safe even when you are not connected. You might be temped to try other servers but you will be at risk being unable to get back on the Hong Kong OpenVPN server. This happened to me last night, I just kept refreshing the server change page until a spot was available. If you try to change to a full server using the software that server will still be shown in the list but you will get an error after you select it. It's better to go to the website and log in with your account and change your server from the website. Then it will only show you the servers which are available. If the Hong Kong OpenVPN server is not available then just keep refreshing the page until it is available. Do not choose the Hong Kong PPTP server. Once you get on the Hong Kong server you need to change the protocol from UDP to TCP. The drop-down selection on the main screen of the software Windows software does not work. It must be changed from the advanced settings section of the software or from the website. If you don't get a good connection the first time just disconnect and reconnect. Sometimes I get a bad connection the first time but then I just disconnect and reconnect then it's fine. The StrongVPN iOS App doesn't support the OpenVPN protocol so I don't recommend the iOS App for China because the Hong Kong OpenVPN server is the only good one for China offered by StrongVPN. Instead you need to install the third party OpenVPN client. If your Apple App store is set to China then this OpenVPN Connect App will not be available. You need to change to the USA App store first. Follow my tutorial here to do this without a credit card. The StrongVPN Android App supports OpenVPN so no need to install any third party software. StrongVPN offers a 5 day money back guarantee. Try it risk-free for 5 days. Which VPN servers are fast enough to stream YouTube 1080P after 6:00pm in China? Recently I noticed an interesting feature of YouTube. If you right click the video and choose "stats for nerds" you can see some statistics such as the streaming speed. I can only find 3 VPN servers that are fast enough to stream YouTube in 1080P right now, which are all servers from my 3 favorite VPNs. With a subscription to all 3 of these VPNs (ExpressVPN, VPN.ac, and StrongVPN) I can always find a server good enough to stream YouTube 1080P any time of day. Please try this yourself and leave your comments below. Open any video on YouTube that has 1080P resolution available. I used this one. Click the settings gear on the bottom and change the resolution to 1080P. right click anywhere on the video area and choose the options "stats for nerds". Play the video for 1 minute. Report the following information in your comment: What city you are in, time of day, VPN server and protocol, whether there was buffering, streaming speed shown after 1 minute. Here are the servers I found that can play 1080P smoothly right now. I have tried many but can't find any more right now. I'm interested to know if anyone else can find any. You actually don't need that fast of a download speed to play YouTube in 1080P smoothly but it's easier said than done in the evenings in China. Check out the speed I had last night when watching YouTube in 1080P after midnight. I don't have to tell you that it loaded quickly and without any buffering! 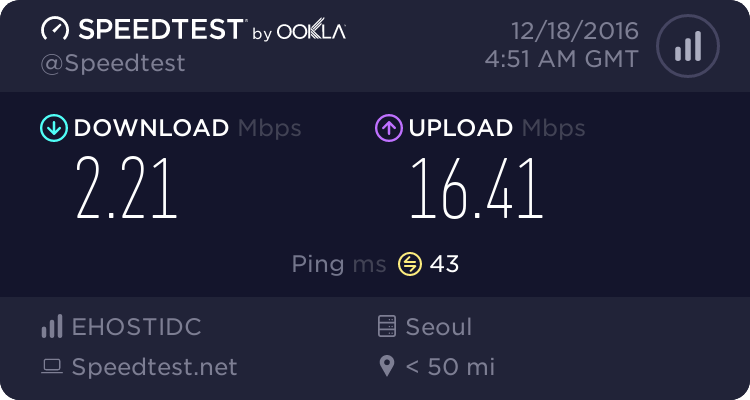 What kind of streaming speeds are you getting from YouTube with your VPN? Don't forgot to mention what city you are in, what VPN server you are using, the time of day, and of course your streaming speed. Today and yesterday I have been trying many different VPN and proxy servers trying to find the best one. I have been testing ExpressVPN, VPN.ac, StrongVPN, VyprVPN, and 12VPN. Here are my conclusions. The fastest VPN server for me is VPN.ac Hong Kong 1 using OpenVPN TCP. However this server is not 100% reliable, the connectivity to the internet is lost at random times due to a problem with their hosting provider. The other servers of VPN.ac are all reliable but not as fast. I choose to continue using VPN.ac Hong Kong 1 as my main connection even though it's not reliable just because I prefer the blazing fast speed over reliability. I flashed dd-wrt on my Linksys WRT1900AC and set this server on it. If I lose connectivity then I just switch to my main router WIFI and connect to something else. The fastest reliable VPN servers for me are ExpressVPN Taiwan 1 OpenVPN TCP or UDP (working very well for me today) and StrongVPN Hong Kong OpenVPN TCP. ExpressVPN Taiwan 1 server often gets incorrectly located in China by GeoIP services. Don't be fooled, this server is obviously not in China. If you are doing a speed test on speedtest.net for example you need to manually choose a test server in Taipei to properly test the speed and latency. The fastest proxy for me is VPN.ac Secure.Proxy Tokyo 3. If you don't mind using a proxy instead of a VPN then this highly recommended. I am using the Chrome Extension but they also have extensions available for other browsers as well. StrongVPN has a function to test your speed to any of their servers from their website. I realized that this is available even if you are not a customer. If you are interested to see what kind of speed and ping times you can get with StrongVPN then simply server page (remember to turn off any existing VPN or proxy connections first). Under the "Static and Dynamic" drop-down menu you must choose Shared IP. The other options Static IP and Dynamic IP are no longer available. They were part of previous plans no longer offered by StrongVPN. 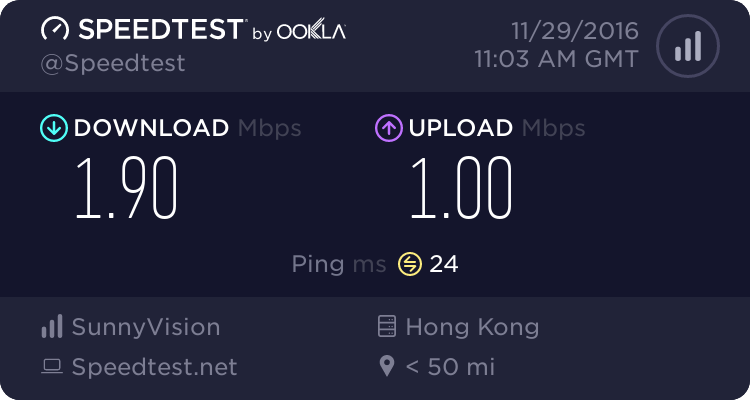 I recommend you go and check your speed to their Hong Kong server. VyprVPN has pretty decent USA servers. The latency is obviously higher than Asian servers but the streaming speed on YouTube and Netflix is not bad. The servers I am using are Los Angeles, Seattle, and San Francisco with the Chameleon protocol. I usually choose the server with the lowest ping time from the location picker in their software. It's always one of those 3. I miss ExpressVPN Hong Kong 3. Using a VPN in China is much better in the morning! Now I am getting quite good results with ExpressVPN Taiwan server. Using a VPN in China is complicated and you can't rely on a single test result to judge a VPN service. Certain servers are better than others at certain times of the day. You really do need more than 1 VPN service if you want to always be able to find a good connection. Over the last hour I have tested extensively trying to find the best low latency Asian server with decent download speed. Here is a summary of my thoughts on the VPN situation in China today. ExpressVPN is normally the best VPN for China but without the Hong Kong 3 server that's not really true. Although they have the best Apps and the best customer service with 24/7 live chat that's not enough. They need to have the best servers too to be considered the best VPN in China. VPN.ac is normally my personal favorite VPN but the connection reliability problem with their Hong Kong 1 server is getting annoying. StrongVPN Hong Kong is currently the best and most reliable server for me. I'm not normally a big fan of StrongVPN but right now they are offering the best server for VPN connections from China (at least in my case using China Telecom from Zhuhai). Using a VPN in China can get very annoying at times. If I didn't have the luxury of having so many VPN subscriptions I would probably get extremely angry and annoyed. I'm just thankful that I can always find at least 1 stable, reliable, fast, low latency server at any time. If you are in China it's highly recommend to subscribe to more than 1 VPN service. No one VPN is perfect so the more options you have the better. It's not difficult to find a VPN that works in China but finding one that works well at 11pm on a Friday night is another story completely. I don't usually talk much about USA servers because I have a strong preference for low latency Asian servers but ExpressVPN and VyprVPN both have very good USA servers which I use for watching Netflix. I just thought that is worth mentioning in case anyone is looking for good USA servers. Here are the detailed test results. The speed is not great but not bad either considering the time of day. It's still good enough for watching YouTube in 1080P (which is what I was doing between 10pm to 11pm). Anyway, I am more concerned with latency than download speed in general and 18ms is excellent. Now I am going to try and find a good server from ExpressVPN. About half hour ago I ran the ExpressVPN speed test on my other computer which is not connected to a VPN. It looks like Taiwan 1 and Malaysia are the best servers to try. Note - Using the TCP protocol the GeoIP service used by speedtest.net incorrectly detected the location as Zhenzhou, China so I manually selected a server location in Taiwan for the test. ExpressVPN Malaysia OpenVPN UDP - Failed to connect. ExpressVPN Malaysia OpenVPN TCP - Missing fro the list when the protocol is changed to TCP. I guess it's only available for UDP? I will try a few more locations just for fun. I won't bother with TCP because the latency is too high on this server, changing to TCP might get better download speed but it won't change the high latency. One last server for ExpressVPN. I may as well try Hong Kong 1 because it's the "top recommendation" in the recommended servers section of the software. When you see these kind of high ping values (high latency) on Asian servers when connecting from China that means that the server does not support direct connections to your ISP in mainland China (China Telecom in my case). These high latency servers are usually bouncing your traffic to the United States and back because it's cheaper to do it that way. Asian hosting with direct peering to mainland China ISPs is expensive, that's why it's so difficult to find good Asian servers. I am going to do a few tests with VPN.ac as well. Their Hong Kong 1 server has been unstable recently but I know they have a few other servers with decent peering to mainland China. Here they are. Finally I am going to also test VPN.ac Hong Kong 1 even though it's not stable recently. If you don't mind having the risk of your internet connectivity cut off for a few minutes at random intervals then I do actually recommend using this server. If your internet gets cut off there is no need to use of disconnecting and reconnecting to the server. Just wait a while and it will come back. It's now midnight and I have been testing for 1 hour already. I am just going to test StrongVPN once more to compare with the first test. I just got back from a 1 week vacation in Malaysia and I am very disappointed to see that ExpressVPN has removed the Hong Kong 3 server from my account! I spoke with a friend of mine who told me that it was removed from his Android App but still available on his Mac. If you are using ExpressVPN please leave your comments below and let me know which devices (if any) the Hong Kong 3 server is available for you. If you are also unhappy about what has been happening with the Hong Kong 3 server send your comments to ExpressVPN by email and let them know what you think about this. I have been complaining myself but I am only 1 person, the more people who complain the more likely they will do something about it such as finding another good low latency data center in Hong Kong to host a replacement server. I am going to test some of the other servers of ExpressVPN soon, check back in a few hours to see those results. I can tell you right now that none of them compare to Hong Kong 3. The only servers that compare are VPN.ac Hong Kong 1 (currently unstable due to a problem with their host) and StrongVPN Hong Kong (best overall server that I can find right now). I am going to flash dd-wrt back onto my Linksys WRT1900AC tomorrow and see how StrongVPN Hong Kong performs on it. I have been running the ExpressVPN Hong Kong 3 server on my Linksys WRT1900AC for 4 straight days now. It is extremely stable, I have not needed to touch this router since connecting to Hong Kong 3 on Sept 21. I have even rebooted my main router (VPN router gets its internet connection from my main router) a few times and not needed to do anything to this VPN router. The ExpressVPN Router App is more stable than anything I have ever used on a router. Unfortunately this ExpressVPN Router App only works with 3 models of Linksys routers so far which are all quite expensive. If you can afford one of these routers I guarantee you will not be disappointed. Here are some links if you want to buy one of these routers on Taobao. Following the instructions on the ExpressVPN website to flash this Router is not very difficult. Last night I flashed my Linksys WRT1900AC with the new ExpressVPN App for Routers and it's working amazing, better than I imagined. The "App" as they call it seems to be a modified OpenWRT firmware with their own custom user interface which is very nice and easy to use. Great speed and latency running the famous Hong Kong 3 server on this router. Here is a screenshot of the Router app (firmware) interface. The only aspect that I don't like about the ExpressVPN Router app is that I can't run any other VPN on it so I will need to flash my dd-wrt or another firmware back on when I need to test other VPNs. In this regard the router apps of VyprVPN and Astrill are better because they run on top of existing firmware which allows you to turn them off and run other VPNs using the OpenVPN client of the firmware itself. StrongVPN is currently running a promotion for 50% off their 1 year VPN plan. Use the coupon code here and pay only $34.99 for a whole year! This offer is valid until Sept 30, 2016. StrongVPN is currently rated #3 on my Best VPN for China page. To be honest it's a distant third place compared to VPN.ac and ExpressVPN. StrongVPN is basically good for 1 server and 1 server only - the Hong Kong server. Most of their other servers work very poorly or not at all when connecting from China. If it wasn't for their Hong Kong server I wouldn't even recommend it all. This Hong Kong server is excellent and is among the top 3 VPN servers that I have ever used in China. The other 2 being ExpressVPN Hong Kong 3 and VPN.ac Hong Kong 1. I wouldn't really recommend StrongVPN if you are only using 1 VPN service in China but it's certainly worth $35 to have access to one of the top VPN servers for connections from China in addition to whatever other VPN you are using. Here is a speed test result that I just did using the StrongVPN Hong Kong server on OpenVPN TCP. Make sure you change the protocol within the advanced settings from UDP to TCP. Changing it on the main screen actually does not work, it must be changed in the advanced settings. Great latency of only 19ms and great download speed of 49.83 Mb/s. Just make sure you are using TCP because you won't get these kind of results with UDP on this server. If you are using a VPN in China you will find that some servers work better with UDP and some servers work better with TCP. Remember to try both, don't assume that one is better than the other for all servers. I still haven't adjusted to Chinese time so I was up at 4:00am this morning with nothing to do but watch the sunrise and test some VPNs. 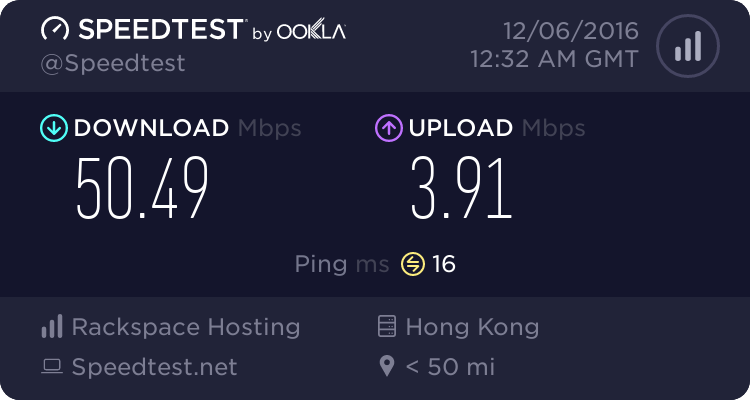 I have been having some connectivity issues with the VPN.ac Hong Kong 1 server recently. The internet connections gets cut off once in a while and I can't load any web pages although the VPN is still connected. I have talked with VPN.ac support and they told me they are aware of the problem and it's caused by their hosting company in Hong Kong. The output of their server is getting cut off randomly for unknown reasons. While they are working with the data center to solve the problem I have switched to the Hong Kong 2 server on my router temporarily. Although it's not as good as the Hong Kong 1 server the speed and latency is also decent and it's very stable. Unlike the Hong Kong 1 server which performs better with TCP the Hong Kong 2 server performs better with UDP. I have set up my router with Hong Kong 2 UDP port 88. Here is my speed test result. The router I am using my new Linksys WRT1900AC that I bought in Canada and brought back to China with me. I am planning to flash this router with the new ExpressVPN Router App when I get some free time in the next few days. Check back soon for speed test results from the ExpressVPN Router App on this router! I am running VPN.ac Hong Kong 1 server on my new Linksys WRT1900AC router and I'm getting very good speed with this server on this router. I just got back to China from my vacation in Canada. More updates and speed testing VPNs from China coming soon! Right now I am using the VPN.ac SecureProxy extension for Google Chrome and I am getting very good speeds using the Hong Kong 2 server. With the VPN I get better speeds with Hong Kong 1 but with the Proxy I get better speeds with Hong Kong 2. I just did an html5 speed test using the Hong Kong 2 location with SecureProxy and I got a very impressive 93.4 Mb/s. I bought a Linksys WRT1900AC in Canada and brought it back to China. This router has a powerful dual core 1.3 Ghz CPU. I will be testing VPNs through this router including the new ExpressVPN Router App. I heard there was some problems with VPNs during the G20 meetings but my VPNs seem to be working fine now. Here are a few quick test results from my favorite 3 VPN servers using the Windows Apps. 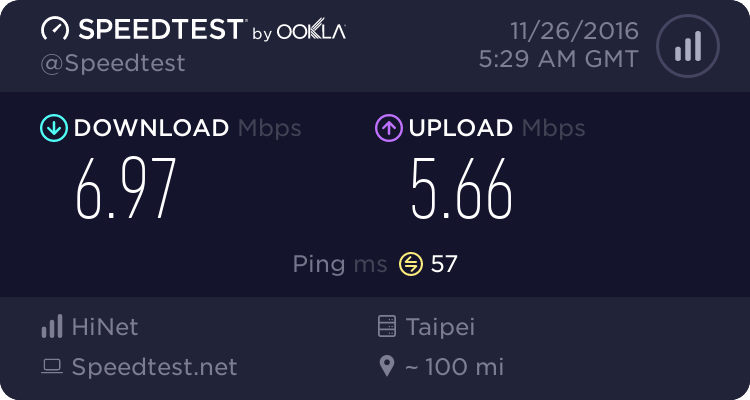 At first I was getting great speeds with Ironsocket Taipei server but recently I am not getting those speeds any more. I have went back to using VPN.ac and ExpressVPN as my main VPNs. It's always nice to have more options and I will keep Ironsocket too but I don't think it will become my main VPN. It's certainly worth $35 using my coupon code and having it as another option. Their DNS Proxy service also works for US Netflix in China without a VPN. When it comes to China I say the more VPN services you have the better! Last night I set up Ironsocket on my Netgear R6250 router running dd-wrt firmware. This was the most complicated VPN set up for a router that I have ever done. Nevertheless I got it done and it's working great. I haven't needed to reset the router yet. It seems very strong and stable. I'm getting around 20M download speed which is about as fast as I can get with any VPN on this router. It's limited by the CPU. Read more below about Ironsocket and the special 30% discount code valid until July 31, 2016. I just realized it's been over a month since I updated this page. Over the past month I have mainly been using VPN.ac Hong Kong 1 OpenVPN TCP on my router as my main VPN. I recently tried to set up ExpressVPN Hong Kong 3 on my router but found it they have removed this server for router connections. It's now only available when connecting with their Apps. The support staff claims this server is "under maintenance" for router and third party OpenVPN connections. I have been pushing for a real answer about what is going on but so far I have not received one. I am going to stop recommending ExpressVPN as the number 1 VPN for China on my Best VPN for China page if they don't rectify this situation soon. Removing the best server for router connections without any notice or explanation is not acceptable! Even though I normally use VPN.ac on my router anyway I don't like what ExpressVPN has done here. On a more positive note I have stumbled upon another extremely good server by accident today. I was testing a service called Ironsocket for my Best VPN for Netflix page and discovered something very interesting. Their Taiwan server has amazing speed! The below speed test was done at 8:15pm in China! This is a very impressive speed especially at this time of night. I'm planning to test Ironsocket more over the next few days and do some speed tests against VPN.ac and ExpressVPN. I will also write a review of their service. In the meantime here is what you need to know about Ironsocket. 1. Using Ironsocket VPN is for advanced users only! They don't have any software at all, not even for Windows. You need to set up the VPN manually in your operating system or use a third party OpenVPN client such as Openconnect, Viscosity, etc. I was testing it today using Viscosity which I prefer over Openconnect because you can save the VPN password. You won't get any advanced features such as auto re-connection and a kill switch but it does the job. 2. Finding a good server is not easy. I found this Taiwan server by pinging several server addresses from their setup instructions until I found one with good latency. If you don't know how to ping servers and judge the latency then it will take you a very long time to find good ones because you will need to set up the VPN connections manually one by one and test them. 3. The DNS service actually works for watching USA Netflix without a VPN! I was surprised because the MediaStreamer DNS from ExpressVPN does not work in China so I thought that all SmartDNS would not work in China, that a VPN connection was necessary for Netflix. The Ironsocket DNS actually works very well. Netflix loads very fast and plays in HD immediately with only DNS, no VPN. Both DNS and VPN are included with all accounts. 4. Ironsocket is priced very reasonably. Only $6.99 per month, $35.95 for 6 months, or $49.95 for 1 year. It gets better. I am happy to announce that Ironsocket is offering an incredible 30% additional discount in addition to these already very low prices from now until July 31, 2016 for visitors of this website. Just go to Ironsocket using this link and choose any plan (monthly, 6 months, or 1 year). You will only get the 30% discount on your first billing cycle so it's recommended to get 1 year to maximize your savings. With the discount code you will pay only $35 for an entire year! If you are an advanced VPN user who doesn't need fancy apps to connect to a VPN this is an incredible deal. Or if you are just looking to unblock USA Netflix from China with their DNS service that alone is worth it. Money back guarantee is 7 days but only if you pay by PayPal or credit card. No money back guarantee if you pay by gift card of bitcoin. This week I have been testing Netflix on various VPNs and created a new page called Best VPN for Netflix. So far ExpressVPN is the only one working reliably on all my test devices (Computer, Android, and iPad). Some VPN providers don't want their name mentioned on that page so you can email me if you want more information on how Netflix performs with all the VPNs I have tested. I got a new router on Friday and have been setting it up and trying different VPNs. The router is a Netgear R6250 and I flashed it with DD-WRT "Kong Mod". So far I'm very impressed with the performance of this router. I'm getting much higher speeds than I ever had with my ASUS RT-N66U with Tomato firmware. I don't know if DD-WRT is better than Tomato or if the Netgear R6250 is better than the ASUS RT-N66U but the speeds I am getting are amazing. Here are the speeds I am getting running the OpenVPN client. I was really surprised to get over 20Mb/s using StrongVPN. StrongVPN also has the easiest router setup. You can download an installer that makes all the settings for you automatically. If you are using VPN on a router I highly recommend StrongVPN. They have a 5 day money back guarantee so you can try it risk-free. Use my promo code TIPS15 and save 15% off their already low prices. Today I have updated the Best VPN for China page which was long overdue. I also updated some information as it relates to Astrill's no free trial and no refunds policy. Last night I made a video to test YouTube HD streaming using my 3 top recommended VPNs. VPN.AC did the best and was able to keep up with HD 4k streaming although my computer was too slow to to play the video properly. I am going to upload this YouTube test video to my YouTube channel soon. VPN.AC Hong Kong 1 server is now working with L2TP protocol. I am mostly using VPN.AC Hong 1 PPTP or L2TP and ExpressVPN Hong Kong 3 OpenVPN UDP servers these days. I am back in China now and happy to see that VPN.AC has some new hosting for some of their Asian servers. 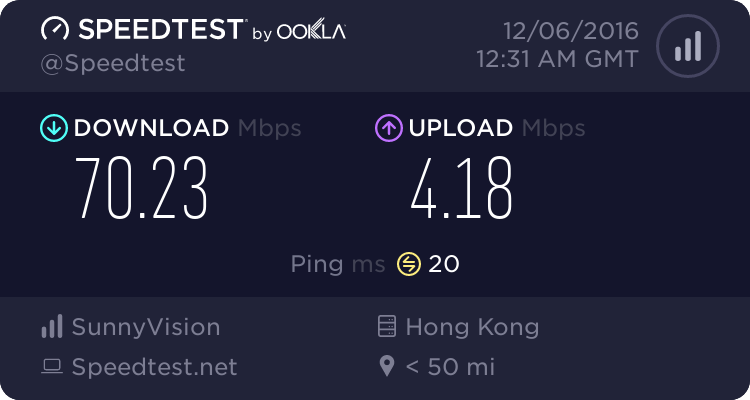 I am connected to China Users Hong Kong 1 PPTP and getting Very low latency comparable to ExpressVPN and StrongVPN Hong Kong servers. I am at my office now where the network is throttled to 800kB/s so I cannot do a speed test right now. I will do a speed test tonight using Hong Kong servers VPN.AC vs ExpressVPN vs StrongVPN. Check back here soon for the results! I am currently on a trip to USA and Canada so there will not be any more VPN testing until I return to China in a few weeks. I did one last test before I left China but I didn't have time to post the results until now. I redid the same proxy test of VPN.AC vs 12VPN that I did on April 25 which was invalid because the 12VPN Google Chrome extension bypasses the proxy during this speed test. I solved this problem by using the 12VPN OpenGUI software instead of the Chrome proxy. I am currently in Phoenix, Arizona and the internet I am using now is only 3M download speed but it's still better than any internet connection in China including 100M DSL or Fiber for accessing websites outside of China. The reason is latency. In the beginning I didn't realize how important latency is but now I understand the importance of latency when testing VPNs. Over the next few weeks I plan on updating my VPN reviews and cleaning up the navigation menus on this website. Any suggestions are appreciated, please contact me by email if you have any. If anyone reading this is a VPN.AC customer please help me check if the latency problem on the Asian servers has been solved yet. This morning I did a speed test using Google Chrome browser proxy extensions to compare the speed and latency of VPN.AC SecureProxy against 12VPN Twelve for Chrome. Aside from this test this morning I have been using ExpressVPN Hong Kong 3 server for most of the day. It's still working great! I am now starting to test 12VPN. They have offered a very generous special 25% discount on any 12 Unlimited Plan for visitors from this website. Use the promo code TIPS25 (same promo code as VPN.AC) for this special discount. The money back guarantee period is 14 days so you can try it risk-free for 14 days but only if you pay with a credit card or Paypal. There is no money back guarantee if you pay with Alipay or bitcoin. If you want to pay with a Chinese bank card, do it through Paypal. Unfortunately they only have 1 Asian server (Tokyo) so it probably won't be my personal favorite VPN. However they do have some other interesting features which I plan to test over the next few days. If having a low latency Asian server is not your biggest concern then 12VPN might be worth a try. I am now recommending StrongVPN for those looking for a good Asian server who have good technical skills who don't mind changing settings and maybe prefer more advanced setting options rather than a simple interface. StrongVPN is only $70/year which is $30 cheaper than ExpressVPN. They both have very good Hong Kong servers with low latency to my location here in Zhuhai, China. If you have never tried using the internet in China through a VPN with a latency under 20ms it's highly recommended that you try it. For me it feels like using the internet in Canada. If you want to try either of these remember that ExpressVPN has a 30 day money back guarantee and StrongVPN has a 5 day money back guarantee. You can get a full refund within this time period. I always encourage people in China to try more VPN services and find out which one works the best for them. You will have absolutely no trouble getting a refund from any of the VPN affiliates on this website within the guarantee period. If any of the VPN companies on this website don't honor the money back guarantee then I will immediately remove them from this website. I have been doing more testing with StrongVPN over the past few days. The Hong Kong server was not working very well today so I started a support ticket. I got a response within minutes and the problem was solved by changing the protocol to TCP. However it seems that you have to change it in the advanced settings as shown below. Changing the protocol from the main screen of the software doesn't work. I find that StrongVPN Hong Kong server is working just as good as the ExpressVPN Hong Kong server however with ExpressVPN it always works without changing any settings. With StrongVPN you may sometimes need to change settings. I am going to do a quick speed test here comparing ExpressVPN Hong Kong server to StrongVPN Hong Kong server. It's funny. With ExpressVPN Hong Kong 3 only UDP is working (TCP not working). With StrongVPN Hong Kong only TCP is working (UDP not working). The download speed is not great for either but it is 10:15pm here in China and the network is very congested at this time, my ISP is probably throttling international traffic during this time as well. Actually the latency is much more important to me and both ExpressVPN Hong Kong and StrongVPN Hong Kong servers have extremely good latency. The speed of 3-4 M is actually good enough if you have low latency. I can still watch YouTube in HD with this speed. Using my new VPN.AC test script I decided to do a quick test to compare the best VPN.AC US server with the best ExpressVPN US server. I choose the best server based on my script for VPN.AC and the built-in server test function of ExpressVPN software. Here are the results. This was just a quick simple test, I am not going to post this in the speed testing section of the website. For PPTP VPN.AC performed much better than ExpressVPN which I was expecting because ExpressVPN PPTP has always been very slow. With OpenVPN VPN.AC performed a little better as well. If you are using USA servers then I still highly recommend VPN.AC. However if you want a good Asian server with low latency then better wait until this problem with VPN.AC's host is solved before trying VPN.AC. Due to the ongoing problem with latency on VPN.AC Asian servers I am now using ExpressVPN most often. I will continue to the update this page with the status of the latency on VPN.AC Asian servers. One of the disadvantages of VPN.AC is the lack a server test function in their Windows software. To save time I wrote a script that will automatically ping all of the servers of VPN.AC so you can quickly identify which servers have the best latency to your location. This now saves me much time looking for the best VPN.AC server to connect to. If you are a VPN.AC customer you can send me an email and I will send you this script file. It is a .bat file that can be run from Windows. However you need to prove to me that you are a VPN.AC customer before I give you the file. You can prove you are a customer by telling me the server name for the China Users servers. You can find this by logging into your account on the VPN.AC website and reading the knowledge base article called "Instructions for users in China" (Client area, Support, Knowledgebase). There you will find a list of servers. Just tell me the name of one of these servers so I know you a VPN.AC customer. When you run my script file you will see results as shown below. Choose the servers with lower ping times. 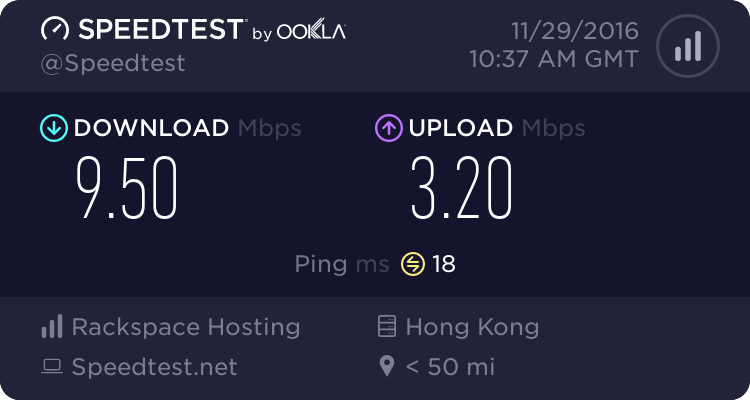 I am also getting very low latency with a Hong Kong server from StrongVPN. I was able to get a very impressive 15ms ping to Google. I have not written much about StrongVPN on this website but it's also a very good VPN to consider in China. The price is $10/month or $70/year which is very reasonable. The interface of the software and switching servers is a little complicated so I don't recommend it unless you have good technical skills. I was surprised to learn that StrongVPN both allows torrents and does not keep logs. I was under the mistaken belief that every VPN provider based in USA must keep logs. I am now much more interested in StrongVPN and will test it more often. StrongVPN also has a 5 day money back guarantee. Not as generous as ExpressVPN's 30 days but still better than VyprVPN's 3 days. I got a reply to my support ticket at VPN.AC regarding the poor latency when using Asian servers. The problem is related to their hosting company for their Asian servers as you can see in the screenshot below. I hope this gets resolved soon. In the meantime I will continue using ExpressVPN Hong Kong 3 server as my preferred VPN. The VPN.AC US West Coast servers are still working good but I prefer to run a low latency Asian server. I will update this page when this problem with VPN.AC Asian servers is resolved. On April 17, 2016 I finally had time to do another speed test. I decided to pay for 1 year of ExpressVPN because of one server and its extremely low latency. The server is called Hong Kong 3 and nothing I have ever tested comes even close to matching the low latency of this server. ExpressVPN is expensive and there are better deals available such as VPN.AC which offers more services for much less money. However I have to say for me personally that the low latency of the HK3 server is worth $100. I'm am now running this HK3 server on my Tomato flashed router, Windows computers, and Android mobile. I have also tested it on iOS. Although not very fast in terms of download speed it feels very fast when browsing the web or watching streaming video due to the low latency. If you want to try ExpressVPN remember that they offer a 30 day no hassle money-back guarantee. If you want to cancel for any reason you can get a full refund. Try it risk-free for 30 days today. If this Hong Kong 3 server stops working or the latency becomes less desirable in the next 30 days then I am personally going to take advantage of this money back guarantee and get my money back. As long as it keeps working like it is currently then I'm happy to pay $100 for it. I challenge anyone in mainland China to find a VPN server (outside mainland China of course) with a faster ping time than what I can get from ExpressVPN. To do this test simply open a command prompt (in Windows hold the Windows key and press R then type cmd). Now simply type the command "ping www.google.com" (without quotation marks). What is the average ping time? I usually get under 20ms with ExpressVPN Hong Kong 3 server. In the image below the average ping time is 17ms. If you can get a better ping time than this please send me an email or leave a comment at the bottom of this page. I am testing from Zhuhai which is quite close geographically to Hong Kong. If you are in Shenzhen then I suspect you can get an even faster time from this Hong Kong 3 server. "An intranet is a private network that is contained within an enterprise. It may consist of many interlinked local area networks and also use leased lines in the wide area network. Typically, an intranet includes connections through one or more gateway computers to the outside Internet. The main purpose of an intranet is to share company information and computing resources among employees. An intranet can also be used to facilitate working in groups and for teleconferences." The big bottleneck of internet speed when accessing websites outside of China is the bottleneck between the intranet of China and the internet of the world. There is limited capacity here and the data also has to be inspected by the great firewall to determine whether or not to allow the data to pass through. The majority of internet users in China are using Astrill so when service was offline to non-stealth members and iOS users that left much more China intranet - Worldwide internet bandwidth available for the rest of us. You can really notice bottleneck during peak night hours 7pm to 1am. What I am now mostly using on my Windows computer is VPN.AC Asian PPTP servers. Usually China Users Hong Kong 1 but sometimes Singapore or Japan. I know that PPTP is not secure but honestly I don't really care. PPTP is faster than anything else and security is not my biggest concern. Most websites with any kind of sensitive data are https:// so you already have another layer of security anyway. On my Android phone I am mostly using OpenVPN UDP and TCP (TCP often works better on poor quality public WIFI and mobile data connections). I don't use PPTP on my mobile because I don't want to use a lock screen and the VPNRoot app doesn't work on the Oneplus Two for some reason. If anyway knows a good solution to use PPTP on Android without a lockscreen other than the VPNRoot app please leave a comment below or send me an email. I am going away again tomorrow for the Tomb Sweeping holiday long weekend. I hope to have more time next week to do more VPN speed tests and update this website more. I will try to do more tests on iOS and protocols other than PPTP. I will also be doing a review on my newest affiliate partner StrongVPN. What is working good for you these days? Please leave your comments below. It is confirmed that Astrill has released a software update and OpenWEB is now working again and working very well. Still no confirmation yet if the iOS protocols (PPTP, L2TP, and OpenVPN) are working. Please leave your comments below if you are using Astrill on iOS. If you have not tried Astrill before you can try it free for 7 days days. Everything else seems to be working normally, I think these NPC meetings might be over actually. I will not update this page any more unless requested. If you want me to test a specific protocol or server with VPNAC, VyprVPN, ExpressVPN, or StrongVPN then leave a comment below and I will update this page with your requested test. I was mostly using VPN.AC SecureProxy over the weekend. It's working better than any VPN right now. I did a review of VPNAC SecureProxy for YouTube yesterday and tested a top download speed of 92.1Mb/s. Here is what is working best as of right now. I have confirmed that Astrill is still working good as well but you need the StealthVPN add-on for $2/month which doesn't work on iOS. Check my FAQ for other options to get VPN on iOS if you are using Astrill. 2. VPNAC OpenVPN and L2TP - Not as easy to install as ExpressVPN. Check my tutorial for using VPNAC on iOS here. I now realize that my WIFI was limited to around 50M for some reason. Using a LAN cable now and getting even better speeds. Big thanks to @SupaMikeZ on Twitter for suggesting to test my speed on China Telecom's speed test site without VPN which made me realize that my WIFI is not working properly. I am getting the best speed (50.6M) and lowest latency (38ms) with the VPNAC SecureProxy Chrome extension using the Hong Kong server. This morning I am using the SecureProxy Google Chrome extension from VPNAC. It's still working good as always even during the NPC meetings in Beijing. If you want to do you own speed test with a proxy make sure you use an html5 speed test such as speedtest.dslreports.com instead of a flash based test such as speedtest.net because the download using flash will bypass the proxy and you are only testing your ISP speed without proxy. Here are my speed test results. VPNAC Sinagpore PPTP server is still going strong 3 hours later. I just got 28M on speedtest.dslreports.com while streaming a movie on another non-VPN computer at the same time. No more VPN testing today because VPNAC Singapore PPTP is working too good, I don't want to disconnect it. I have a theory that VPN internet connections that still work are much faster during peak night hours recently because all of the offline Astrill non-stealth members and iOS users who are leaving more available bandwidth for the rest of us. Also, I used ExpressVPN on the iPad for a while. HK3 is down but Seattle was working. Check out the new page I made today. Frequently asked questions about usinig a VPN in China. I got this tweet today from someone who who got 72.9Mb/s download speed with Astrill StealthVPN VIP server ($10/month add-on). I thought that was quite impressive until I saw his next tweet with 90M with VPNAC PPTP Singapore server! I'm very jealous of this guy because I can only get 15M from the same server. Nevertheless the latency is very low and this VPNAC Singapore PPTP server is the best working server for me today and what I am using for my normal internet use outside of the VPN testing. The guy from Twitter also confirmed that only Stealth is working for Astrill currently. I did a quick PPTP test including the newest affiliate partner StrongVPN. The PPTP servers of ExpressVPN seem to be all blocked. I tried around 10 servers, no successful connections. OpenVPN is working good for ExpressVPN, I have been using it off and on tonight. Not the fastest speed but the fastest ping time and the best connection for watching YouTube. See the PPTP speed test results here. Not really a proper speed test but just writing about my experience and random speed tests I did. After I got home from work I first tried VyprVPN PPTP Los Angeles. I didn't do a speed test right away, just opened my Gmail and did some web surfing. It felt slow but my girlfriend was watching streaming HD Chinese TV shows on the other computer so I wasn't expecting great speeds. After about 10 minutes the connection stopped working. Next I tried ExpressVPN OpenVPN UDP HK3. It felt faster than VyprVPN PPTP did. I did a speed test and the result was 2M. I thought that was acceptable so I started reading some news and updating this site. The connection kept getting slower and slower. It seemed like the government was throttling the connection after some time. I did another speed test and the result was 0.1M. Next I connected to VPNAC PPTP Only US West and I got 16M. Now 20 minutes later I'm getting 18M meanwhile the annoying Cantonese streaming TV show is still playing on the other computer. PPTP seems to be the best working protocol right now. I might do a PPTP speed test tonight VPNAC vs ExpressVPN vs VyprVPN. Hopefully ExpressVPN has improved their PPTP since I made this PPTP speed test YouTube video last month! Last night some servers were blocked but speeds were not throttled on the working servers. I was testing the ExpressVPN iOS app which uses L2TP connection protocol. I tried around 10-15 servers and I could only connect to HK3 and Singapore Jurong. Although only few servers were working the speeds on these working servers from ExpressVPN were better than VPNAC speeds. I tried the VyprVPN iOS App which also uses L2TP connection protocol but I could not get a usable connection. The connections were successful but there was no internet connectivity on any of the servers I tried. For VPNAC on iOS I tested OpenVPN, PPTP, and L2TP. Most of the servers were working, best speed was using L2TP but not as fast as ExpressVPN L2TP (Max speed 10M with VPNAC L2TP HK1, 20M with ExpressVPN HK3). I still can't load South China Morning Post using ExpressVPN HK3, I hope they sort it out soon because none of their other servers work as good as HK3 and it's annoying having to switch VPN just to read the news. Twitter links also not working with ExpressVPN HK3. Fast VPN speeds are back. Everything is working properly again for VPNAC, ExpressVPN, and VyprVPN. Not sure if Astrill Openweb and OpenVPN are working again. Please leave a comment below if you're using Astrill. Everything seems to be back to normal now. I can connect with PPTP again, most servers working, speed it not throttled. I'm not getting ~15M with VPNAC PPTP and 10M with ExpressVPN OpenVPN. VyprVPN is working again too but I didn't do a speed test yet. Looks like the government has stepped up the blocking and throttling. PPTP not working at all anymore. VPNAC and ExpressVPN still have some OpenVPN servers working but nothing is working for VyprVPN right now. VPNAC Chrome extension still working. What is working is throttled to about 0.5M (500 kbits/sec). The speed tests are starting off faster (up to 2-3M) and then immediately going down to ~0.5M. Streaming video is buffering often and low resolution. Currently only ExpressVPN is working on my Tomato flashed router (cannot connect with VPNAC or VyprVPN). Due to the NPC the government is actively blocking and throttling all VPN services since yesterday, Mar 4. Nothing is working exceptionally good but here is what is working the best for me. Please leave your comments below about what is working or not working for you. I hear that Astrill StealthVPN is working but I haven't tested it personally. It's highly recommended to have a second VPN subscription if having uninterrupted VPN access is important to you. Check the links on this site for discounts, trial offers, reviews, etc.